← Open Help Thread – Critique Day! 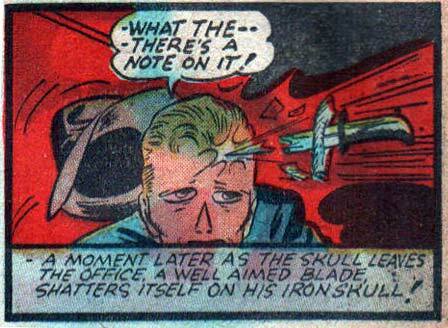 Well, if there’s a note on it, doesn’t that imply the knife-thrower didn’t mean to kill him? Unless it was supposed to be a triumphant note taking credit for the kill…. Don’t confuse the issue with facts, X-Stacy. By the time you read this, you will be dead! How odd. I’d think all those sharp objects caused lots of bleeding wounds as they scrape the scalp. Maybe he doesn’t have a scalp and that hair is just painted on.